If you were surprised by the technology in LEGO® MINDSTORMS NXT, you just might be amazed that LEGO plastic can work with TETRIX metal. TETRIX features heavy-duty, aircraft-grade aluminum elements for construction; powerful drive motors; and expandable capabilities. TETRIX provides the ideal platform for creativity. The trademarked hole pattern on TETRIX structural pieces is unique to this system and enables you to attach pieces together at multiple angles. The metal building system was designed specifically to work with the LEGO® Mindstorms NXT building system through the use of the innovative Hard Point Connector. 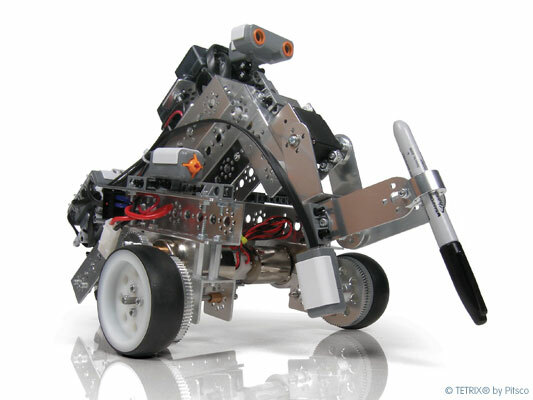 TETRIX, combined with custom motor controllers from Hitechnic, enables your students to use the power of the MINDSTORMS technology and incorporate and control powerful DC and servo motors and metal gears. Your students can now build more versatile and robust robots designed for more sophisticated tasks, all while mastering basic wiring, multi-motor control, and much more. Instruction with TETRIX is limited to our Advanced Robotics students. Enroll your daughter or son today and open their world to technology and techniques that can benefit their lives into adulthood.